Blanket of PROTECTION " @ Nepal Mission. We are based in Bhaktapur, Nepal & our NIM headquarters is in New Delhi in the below mentioned address. Post earthquake in Nepal, we are supporting 180 Children on a regular basis in the Wings & Words Children Club. They all are living in the Shelter homes in the community together. Our project is going on there. North Indian Mission has invested much & rebuild 250 families in Bhaktapur district of Nepal. We have dedicated sponsors to us from 15 Nations & also from India. 1. We will be distributing the Blankets in Bhaktapur & Nepalganj districts in Nepal. We do have our own Children Club called " Wings & Words ". 2. The Earthquake affected children & their families will be benefitted. We have our own Projects called Bucket of HOPE, Blanket of PROTECTION, WINDOWS & WIDOWS etc. 3. North Indian Mission, is a Registered Charitable trust under New Delhi, India. We are supporting the Earthquake affected children in Nepal. We are almost helping 180 Children every month for their Educational & Personal Needs. In this Winter we are raising this funds to support these children along with other children for Winter Clothes & BlanketS. We will be SUPPORTING the CHILDREN in BHAKTAPUR, NEPALGANJ, GORKHA, MAKWANPUR where we have WINGS & WORDS CHILDREN CLUB going on. Our target is to support 1000 children by 1st week of DECEMBER '2016 (250 Blankets in each destination). One Blanket costs INR 350 (6$). We request you to share your hearts & hands for these children.
" 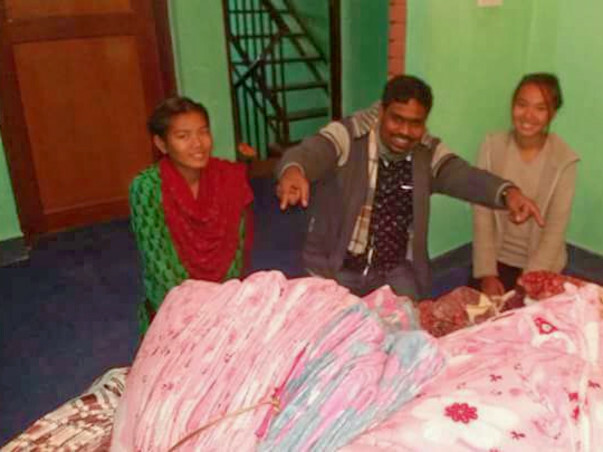 Blanket of PROTECTION " @ Nepal Mission. Please support these children. We are very happy to share this update with you all! The North Indian Mission has adopted 100 families in Bhaktapur and the funds raised have been put for the betterment of these families. In December 2016, the project Blanket Of Protection was started. The adopted 100 families were provided with blankets, woolen socks, sweaters and pullovers along with other warm clothing as per their need. The project has created a community of these 100 families wherein The North Indian Mission takes care of the well being of the 180 kids from these families and education is provided to them. We appreciate the wonderful support you have shown towards this noble initiative. Be blessed in the Lord!